Hey there. Been creating again today :) I worked on cards for challenges today-this one is for Vive La Verve. The Club Scrap kit for April is called Dahlia and it's gorgeous! Beautiful colors and papers as always! 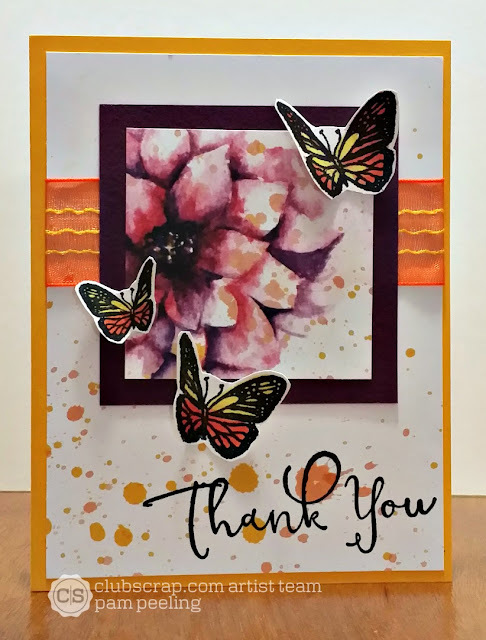 All the materials for this card are from the Dahlia kit. Here is the sketch for this month's challenge. The only stamping I did was the sentiment and the butterflies. The other images are the printed papers from the kit! So pretty! I colored in the butterflies with an aqua painter and stamp ink, then cut them out by hand. The ribbons and fibers that come with the monthly kits are so awesome! I love this wide orange one! Absolutely stunning card for this sketch, Pam. How beautiful! Love the colors and that beautiful flower paper. Thanks for playing along with Viva la Verve!